Let me just say right off the bat that I’ve never been to the quiet little village of Charlestown of Aberlour which lies just down the A95 from the Aberlour Distillery, so please don’t take this as any sort of travelogue or destination review…or, for that matter, thanks to a very limited travel budget at the moment, shameless flummery. If I do ever find myself in that neck of the woods, I know for damn sure I’ll be taking all my meals, drinks and naps at The Mash Tun. How could I not? I mean look at this place! This charming inn/pub/restaurant looks like a little bit of heaven complete with well more than 100 whiskies including the Glenfarclas Family Cask collection and a restaurant serving locally sourced Scottish fare with a contemporary twist. As great as the Mash Tun looks, I’m sure I’ll be able to tear myself away to take Aberlour’s well-regarded distillery tour, which probably features this malt as one of their stalwarts. Like their 16 Year Old, Aberlour’s 12 Year Old is, as the “Double Cask Matured” moniker suggests, matured in two kinds of casks, ex-sherry and ex-bourbon for at least 12 years and then “married” together for a short period before bottling. The Nose: Thick clover honey and Oloroso sherried notes should come as no surprise, definitely ripe & fruity as well, with a juicy grape-dessert wine quality and quiet hints of Juicy Fruit gum. Good toasted, sugared nuts quality as well, think almond cake or creme brulee. Just below the surface are some ever so slightly sour malt notes and wood; polished oak with hints of nutmeg, anise, and allspice. The Palate: Still fruity with a lush mouthfeel, more honey and dessert wine sweetness to start, accompanied almost right away by a spicy, slightly hot zing of rich toasted grain and spicy-sherried wood notes. Good zippy tannins, and more christmas spices towards the end, drying clove and nutmeg with a bit more anise. The Finish: All those sherried baking spice notes fade a little quickly, leaving spicy-sweet tannins behind. Thoughts: I think I enjoyed the 12yo as much, if not a little more than the Aberlour 16yo. A wonderfully honeyed nose pairs well with its zippy, spicy palate. The sherry influence is strong, sure, but not overblown, allowing the nice combination of wood and baking spices to really shine. For around $35, this is a terrific value and perfect one to try if you know you like the ubiquitous Macallan, but are looking for something new and a bit more interesting. Aberlour make lovely whiskies. Sherry i love. this one is a great value for $35?! wow. 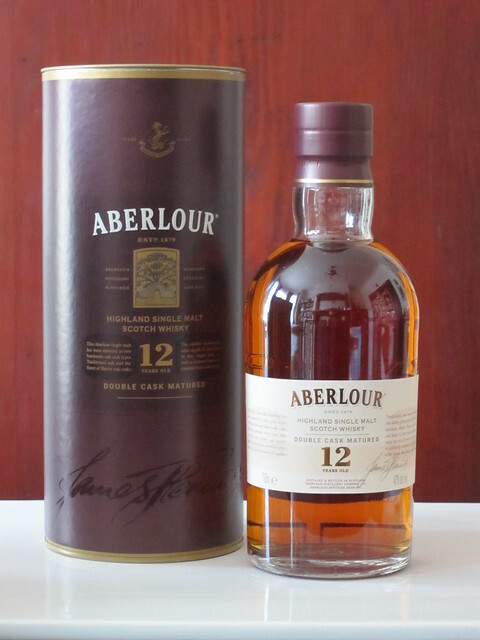 I’ve always like Aberlour but never have much around…that’s going to change. Abelour has long been a favorite whiskey. I “accidentally” discovered it on a connection through Heathrow one morning. To my palate, it is far superior to many other single malts. Perhaps I may be prejudiced, as my grandmother was a Campbell. Lets keep it a secret, so the price does not rise to the heavens.